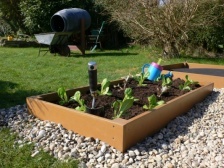 This Recycled Plastic Playground Equipment made by Red Monkey needed some accessories to bring it to life. 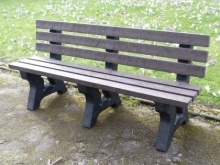 These were designed and manufactured by Kedel, and made from HDPE plastic sheet with up to 80% Recycled Plastic content. 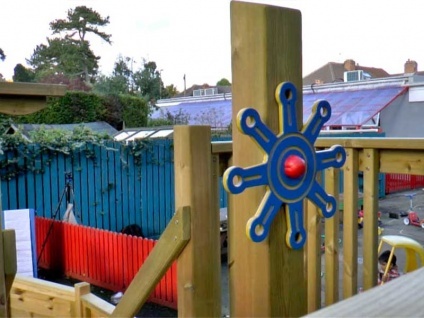 This was just what Red Monkey needed to bring a touch of pirate magic to their beautiful outdoor playground equipment. 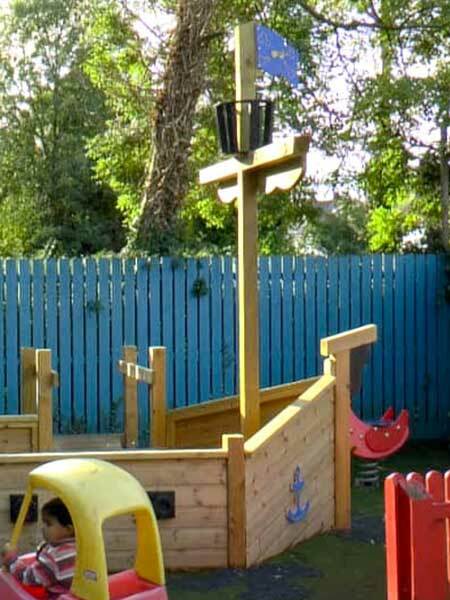 This Wooden Pirate Ship play equipment was made for St George's Nursery School in the Midlands, and is one of several to be found in nurseries and kindergartens dotted around the UK, all made by Red Monkey. Staff at the nursery told us the Pirate Ship is the most popular play area for the children, though when we went down to video them playing in it, things didn't really work to plan. Instead of dancing excitedly on the deck of the Pirate Ship, the children were rather nervous of the strange man with a piano accordion who began playing a sailor's hornpipe very loudly in their playground. Sadly only two children ventured into the picture during the entire video shoot, though the staff insisted that they, at least, had enjoyed the music. 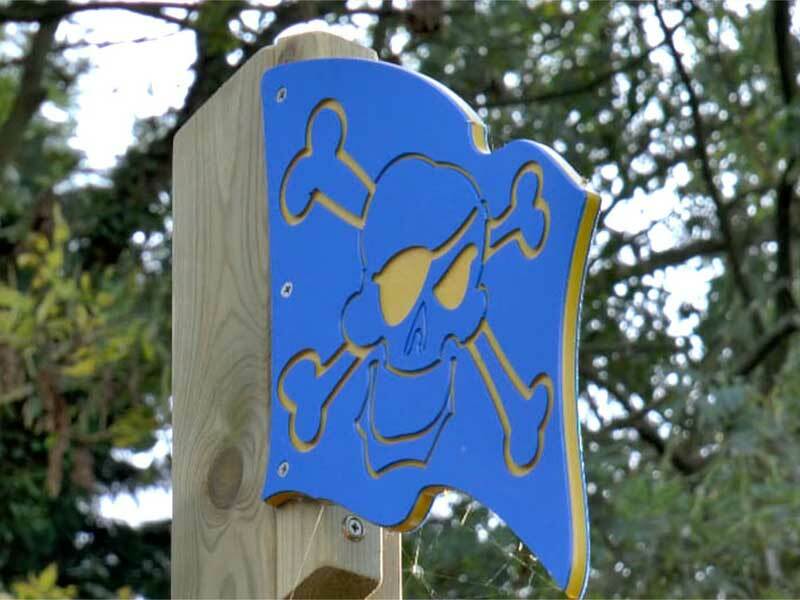 The Pirate Flag sits just above the crows nest, and along with the other accessories, was cut out of an HDPE sandwich sheet of two colours, with the scull and cross bones etched into it. These were created at Kedel's manufacturing and design facility in Colne, Lancashire, using a state of the art CNC machine–a sort of robotic, computer controlled cutting machine. These HDPE sheets contain up to 80% recycled plastic from things like milk bottle cartons collected from household collections. Solid one colour sheets are also available, but two colours were need for this project, allowing various shapes to be etched out of them to reveal the inner colour. This Pirate ship also had recycled plastic anchors at the front and a recycled plastic steering wheel located on the ship's rear fo'c'sle. 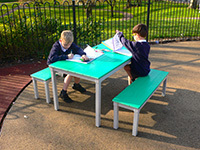 Recycled Plastic is becoming very popular in the education market for Outdoor Playground Equipment, such as benches and picnic tables, role play furniture - outdoor play kitchens and other accessories for the outdoor classroom. 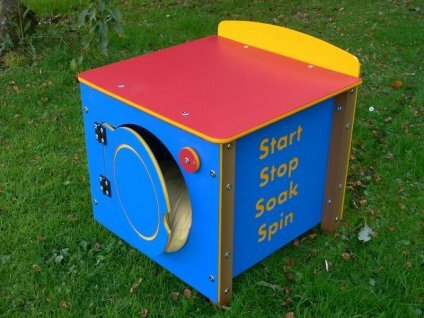 The HDPE sheet with sandwiched colours allows a phonics approach to teaching, with associated words and letters cut out of the play equipment, helpful for learning to read by association. It will never rot, and has a high degree of UV protection against fading in direct sunlight. 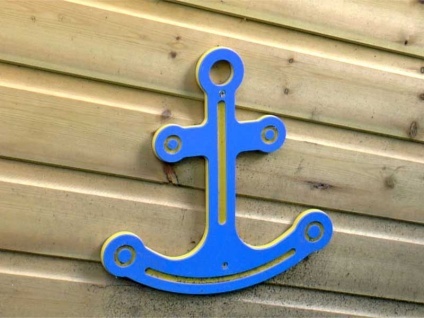 Kedel are now in discussions with Red Monkey to see if the whole ship and all their other designs of playground equipment can be economically produced in recycled plastic rather than wood. Recycled plastic will last at least 5 times longer than treated wood, and continue to look good the whole time, with no maintenance. Recycled Plastic Playground Equipment actually works out much cheaper when set against the whole life of the project. Recycled plastic Playground Equipment needs no treatments at all, as it never rots, and is hygienic and easy to clean with normal household cleaning materials. Being non absorbent, even after rain, a quick wipe down removes the water, and the playground equipment can be used immediately without fear of creating any damp bottoms. Mould cannot adhere to it, and if, after a few years, any appears, it can simply be wiped off, leaving no residue or slippery surface. Wood has splinters that can cause injury and tears. Recycled plastic does not warp, crack or splinter. No matter what the weather, recycled plastic playground equipment will be safe from harm, and will last for decades without any maintenance or replacement bills. 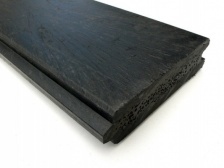 Eco-friendly, maintenance-free tongue and groove boards that are ideal for a variety of applications and will last, at least, 25 Years. Kedel's Tear Drop Tongue and Groove boards/profiles will never rot, warp, splinter or crack. 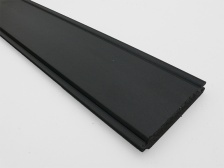 They are UV protected to the highest standard to minimise fading. A far more cost effective material compared to wood. Comes in various colours and is made from crushed recycled CD cases.